R.I.P. Darling's (1929-2010). It's unfortunate that our last visit there was not up to par. We look forward to trying the new DiParma's Italian Table when it opens in the spring. Click here to read the full story posted in the ProJo. Every once in a while, Mom comes up with a fantastic idea, and today's idea was simply delicious. 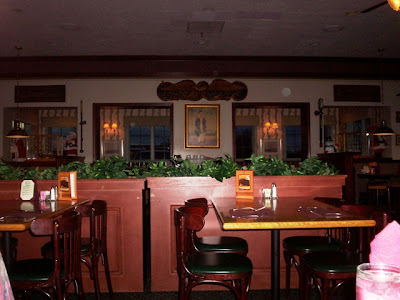 Unable to decide on a place to have lunch, Mom suggested that we finally visit Darling's Restaurant & Lounge, which is connected to the Ramada Inn in Seekonk. I figured since it has been open since 1929, and since Mom has been driving by it since she was a child, we might as well give it a shot. I pulled into the parking lot at just about 4:30 p.m.
After making our way through the very icy parking lot, we went inside. Right away I felt as if I were stepping back in time, but in a good way. 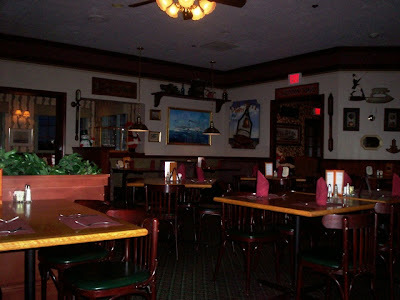 A friendly hostess greeted us and took us to a booth in the large dining area. She left us with two plastic-covered menus and told us that our waitress would be right over. Already on the table was a wine list and a dessert menu. Mom and I were the only two in the dining room, and that was fine with us. It gave us a chance to read the menu and check out the interior without any interruptions. It wasn't very long before a waitress dressed in a black and white uniform appeared. Her name was Natalie, and she was to be our server. She poured two glasses of ice water for us (which had a bit of a metallic taste to it), and then proceeded to take our drink order. We chose two Diet Cokes, and Natalie quickly retrieved the two beverages, which arrived in real glasses. Because Mom and I were still undecided, we asked for another minute to look over the menu. There were so many things to choose from, along with a list of daily specials that sounded amazing. Finally, we had made a decision. Natalie came back to the table and took our order. 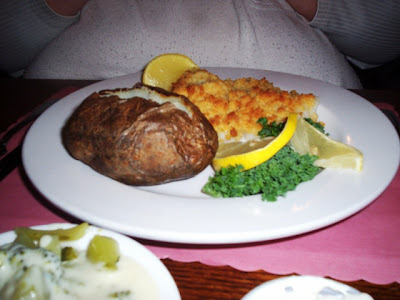 Mom chose the broiled scrod ($13.99). Her meal came with a potato and vegetable option, and Mom chose a baked potato and broccoli au gratin. I chose one of the Saturday daily specials - the baked stuffed fillet of sole ($16.99). Also with a potato and vegetable option, I chose the fries and spinach. Both of our meals came with soup or salad. Mom chose the minestrone soup, while I chose the salad with creamy Italian dressing. Natalie took the menus away and left Mom and I to further check out the dining room. Darling's has a very homey feel to it. This is the kind of place that you could bring a date, your mother, or have a get-together in one of their function rooms (which seat groups of 10 to 300). Made up of both booths and tables, the seating here is very spacious, so you don't feel like you're on top of the other patrons. The main element in the room is wood. From the pictures on the walls, to the tables and door frames, everything is surrounded by dark wood, which gives dining here a cozy feel. The walls are decorated with various knickknacks, pictures, and local artwork, and the tables are set with mauve paper place mats and cranberry cloth napkins (no tablecloths). The staff had decorated the dining area for the holidays, and with a large Christmas tree in the corner of the room and Christmas music playing in the background, we really felt like we were having dinner in someone's country home. Hanging lights were situated above each booth, and the floral wallpaper added a very decorative touch. While we were waiting for our food to arrive, I asked the hostess if Darling's had a takeout menu available. They did, and she handed me two copies. Before we knew it, our soup and salad had arrived. Mom's minestrone soup was thick with vegetables, had a very tasty broth, and was served nice and hot. She said that it was very tasty. My salad was filled with fresh greens, and accompanied by a small cup of creamy Italian dressing. The dressing was cool and refreshing, and one of the best parts of the salad was the croutons. They were outstanding! Aside from serving lunch and dinner, Darling's serves breakfast. I spotted a takeout breakfast menu, but I wasn't able to get my hands on it. I can only imagine what fantastic treats you would be starting your day with at Darling's. For the regular menu, you can really get just about anything. Their appetizer list (a.k.a., "humble beginnings") consists of fresh fried calamari ($7.99), clams casino ($7.99), and Darling cheesy chips ($4.29), which are cheesy chips blanketed with cheddar cheese sauce and bacon bits served with your choice of sour cream or salsa. For soups, Darling's has the soup of the day ($2.39-3.29), baked onion soup ($4.29), and the New England quahog chowder ($3.59-4.29). This chowder is made from founder Eileen Darling's original recipe. Salads include the Caesar ($4.99; with chicken - $8.49; with shrimp - $12.49), Julienne ($8.29), and the Dianne ($7.99), which includes tender morsels of marinated chicken breast tossed with garden fresh lettuce, crisp noodles, toasted almonds, and Darling's own Dianne dressing. Meat entrees include the broiled fillet mignon (8 oz. - $19.99; 6 oz. - $17.99), the Yankee pot roast ($10.49), the veal cutlet ($13.49), and the sweet and spicy marinated tips ($13.99), which is eight ounces of tender tips marinated in Darling's own special recipe. Seafood specialities include scallops (fried bay or baked sea - $14.99), shrimp scampi ($15.49), and the lobster saute (market price). Also available are combination plates such as the barbecued chicken and ribs ($16.99), the Fisherman's Wharf ($19.99), and the surf and turf ($18.99-19.99), which includes a six ounce choice fork tender fillet mignon broiled and paired with two jumbo stuffed shrimp or baked scallops. All dinner entrees come with your choice of pasta or potato and vegetable. For a lighter meal, customers can choose something from the Darling's sandwich board. All sandwiches are available on white, wheat, marble, bulkie roll, or in a wrap, with your choice or onion rings, fries, or cole slaw. Sandwiches include the Reuben ($7.99), BLT ($4.29), grilled cheese ($2.99), French dip ($7.49), and the lobster roll (market price). You can also choose to build your own 8 oz. burger with an array of toppings including tomato, cheese, and sauteed onions. Daily specials include baked meatloaf on Monday ($8.99), shepherd's pie on Tuesday ($8.99), fish and chips on Wednesday ($9.99), braised short ribs on Thursday ($11.99), roast prime rib on Friday ($16.99-18.99), franks and baked beans on Saturday ($7.99), and a roast turkey dinner on Sunday ($11.99). For each day, there are several specials available. Both Mom and I were delighted when we spotted Natalie carrying a large tray with what looked like our dishes upon it. She placed the tray down on a nearby table and came over to hand us our food. Everything looked amazing. Natalie asked if there was anything else she could get for us, but we declined. Mom found her broiled scrod to be perfect. It was tender, white, and flaky with a buttery crumb crust on top. She said that it was so good, she wished there was more of it. Her baked potato was done perfectly, and was accompanied by a few butter pats and a cup of sour cream. The inside of the potato was soft, hot, and just the way a baked potato should be. Since Mom is not a fan of broccoli au gratin, and she later revealed that she had ordered it because she knew that I liked broccoli, she pushed that dish over to my end of the table. Mom really enjoyed her dish, and she said that the whole meal was just fantastic. 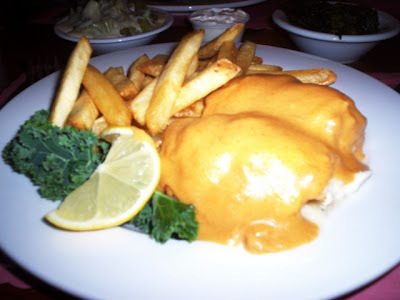 My baked stuffed sole was topped with a Newburg sauce and filled with seafood stuffing. For $16.99, I would have liked a little more fish and a little less fries, but the taste of the fish was out of this world. It was one of the best baked soles I've ever had. The fish was tender, the stuffing was hearty, and the sauce was extremely flavorful. My spinach was very good - a little on the watery side - and Mom's broccoli au gratin had a nice flavor. My fries were also very good, but had a slight hint of a fishy taste. Perhaps they were cooked with someone's fried seafood dish. All in all, I think it was a great meal, and I would suggest this dish to any seafood lover. After our delicious seafood meals, we found ourselves thinking about something that we had seen on the dessert menu - Darling's homemade Grape Nut custard, a New England favorite. 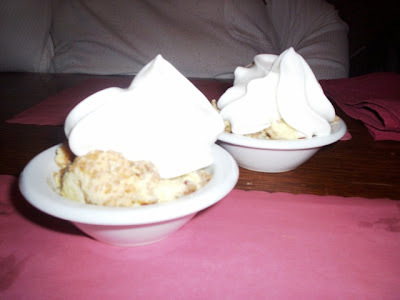 Normally we don't bother with dessert, but neither of us had ever had Grape Nut custard before, and we figured that since we had a great entree, Darling's was sure to make a great dessert. Natalie came by to clear away our plates. She asked us if we would like dessert, and Mom placed the order for the two custards ($2.99 each). They quickly arrived topped with a dollop of whipped cream. Mom and I thought the taste was amazing. It was warm, but the custard was cool and refreshing. The softened Grape Nut cereal gave it a sweet and nutty flavor, but the sweetness was not overwhelming. We both had no problem finishing our cups of this delicious New England treat, and we kicked ourselves for not having tried it before. We left $51 on the table for Natalie, including 20% tip for her excellent service. As we headed toward the entrance, we were wished well by both the hostess, and what seemed to be the owner of the restaurant. Before heading out, Mom and I decided to visit the restroom, which was located in an odd place between the hotel and the restaurant. The bathroom had a very old fashioned style, but it was very clean and organized. Outside of the bathroom in a small lobby area was some old fashioned Christmas decorations, a stamp machine, a payphone, and some local maps for the traveling customers. 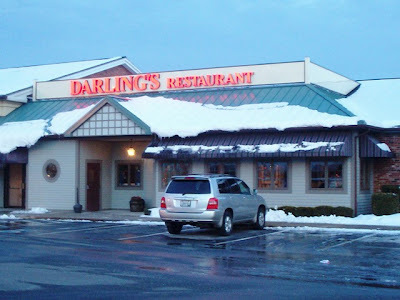 I have no idea why it took my mother over 50 years and myself almost 30 years to visit Darling's Restaurant. Perhaps deep down we knew that once we made the initial visit, we'd instantly become hooked. Now that we've finally been, we can't wait to go back. 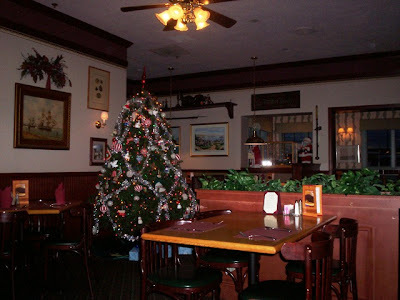 Darling's Restaurant & Lounge is open daily (sans Christmas) from 7 a.m. to 10 p.m.